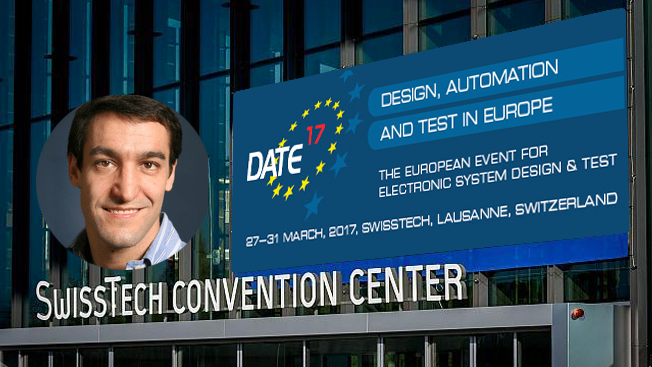 David Atienza chaired a very successful 20th edition of the Design Automation and Test in Europe (DATE) Conference at the SwissTech Convention Center in Lausanne from March 27th to 31st, 2017. The Conference, which was held in Lausanne for the first time from its traditional locations of Dresden (Germany) and Montpellier (France), was attended by more than 1400 people from over 50 countries around the world and hosted 21 exhibiting companies. As a co-sponsor of the event, EcoCloud held a session at the Exhibition Theatre and performed three demos at the exhibit. The session at the Exhibition Theatre focused on challenges associated with datacenter design by highlighting Cloudsuite, a performance benchmarking suite for cloud services developed at EPFL, and data protection on RDMA network on Catapult by our industrial affiliate Microsoft. The demos provided further hands-on experience and information on the topics discussed at the Exhibition Theatre which were complemented by the implementation of scale-out NUMA protocol on FPGA. You can find more information on DATE here.